BACKGROUND AND PURPOSE: Various lines of evidence implicate cerebral involvement beyond the motor cortex in ALS, including the cingulate gyrus and the thalamus. The purpose of this study was to assess neurodegeneration in these regions in vivo by using MRSI. MATERIALS AND METHODS: Fourteen patients with ALS and 14 healthy controls underwent MRSI by using a coronal acquisition scheme. The NAA/Cho ratio was quantified in the MCC, thalamus, and motor cortex (PCG). RESULTS: NAA/Cho was reduced in the MCC in patients with ALS compared with the controls (P = .0004). There was no difference in NAA/Cho in the thalamus (P = .59). We also found a strong correlation of NAA/Cho among the PCG, MCC, and the thalamus in controls, which was absent in patients with ALS. CONCLUSIONS: Neurodegeneration beyond the motor cortex is present in the MCC in ALS. The significant correlation of NAA/Cho among the PCG, MCC, and the thalamus in healthy subjects likely reflects the neuronal connectivity among these regions. The loss of these relationships in patients with ALS suggests that such connectivity is not responsible for the pattern of degeneration in these regions. The cingulate cortex, the largest part of the limbic system, is divided into the anterior cingulate cortex (Brodmann areas 25, 24, and 32) and the posterior cingulate cortex (Brodmann areas 23 and 31). The anterior cingulate has been further recognized as having 2 divisions: the perigenual cortex and the MCC. The MCC is the posterior parts of areas 24 and 32. This differentiation is based on histology, function, and neuronal connections. Histologically, the MCC has a very dense layer, (Va), which contains small and large pyramidal cells, and a large density of neurofilament-positive layer, (Vb), neurons. In terms of connections, the perigenual cortex receives input from the thalamic nuclei and amygdala. The MCC receives extensive thalamic afferents, input from the inferior parietal lobes, and less input from the amygdala. The MCC contains the CMA, which project to the motor cortex and spinal cord. It is involved in response selection and reorganizing behavior for changing rewards, while the perigenual cortex has been implicated in emotional behavior, cognition, and autonomic regulation.6 The extensive fibers from the thalamus to the MCC and the consequent ability of MCC to sample more thalamic input than any other cortical area may be a crucial factor in regard to its role in selecting appropriate motor responses. Given the crucial motor connections and functions of the MCC and the presence of widespread thalamocortical and thalamocingulate projections, we sought to determine the in vivo neurochemical changes in these regions reflective of neuronal degeneration. Thus, we hypothesized that the spectroscopic marker of neuronal integrity, NAA, is reduced in these regions. Subjects were recruited from the ALS Clinic at the University of Alberta. The imaging features of the corticospinal tract in most of these patients have been reported previously.7,8 Fourteen patients with ALS and 14 controls were studied. Two patients had definite ALS, and 12 patients had probable ALS by the El Escorial criteria.9 The mean age of the patient group was 55.9 ± 15.4 years and that of the control group was 53.7 ± 12.4 years. The male/female ratio was 7:7 in patients and 8:6 in the control group. The mean duration of symptoms was 22 ± 17 months. The mean ALSFRS (a measure of general disability; range, 0–40) was 30 ± 6. The rate of disease progression for each patient was estimated as rate = (40-ALSFRS)/symptom duration.10 The study was approved by the Health Research Ethics Board of the University of Alberta. Informed consent was obtained from all subjects. Imaging was performed on a 1.5T MR imaging system (Magnetom Sonata; Siemens, Erlangen, Germany).6 In brief, anatomic locators were followed by a 2D spin-echo MRSI sequence (TR = 1500, TE = 135 ms, n = 4, 12 × 12 phase encodes interpolated to a 16 × 16 matrix, FOV = 160 × 160 mm). The nominal voxel size was 1 × 1 × 1.5 cm and 1.5 cm3 after k-space filtering. The slab was angulated in a coronal plane to enclose the corticospinal tract (Fig 1). This volume of interest intersected the motor cortex, MCC, and thalamus. Spectroscopic imaging. A coronal MR image is shown on the left demonstrating placement of the volume of interest (thick white border). Voxels identified for analysis included those in the PCG (squares), MCC (open circles), and thalamus (closed circles). A representative spectrum from each of these regions is presented on the right from a control subject and a patient with ALS. LCModel (Stephen Provencher, Oakville, Ontario, Canada) was used for off-line processing of the spectroscopic data and quantification of intravoxel metabolite peak areas.11 NAA was expressed as an NAA/Cho ratio. In this regard, Cho was chosen as an internal reference metabolite because previous spectroscopic studies have revealed larger effect sizes and accuracy profiles for NAA/Cho compared with NAA/Cr.8,12–15 Voxels were assigned to the MCC, thalamus, and motor cortex (PCG) (Fig 1) . Metabolite ratios for each region (ie, MCC, thalamus, and PCG) were calculated by determining the average ratio for all voxels assigned to that region. Group differences in NAA/Cho within regions were determined with 2-tailed t tests, and relationships were determined by calculation of Pearson correlation coefficients. Statistical significance was set at a 2-tailed P < .05. In control subjects, NAA/Cho was highest in the PCG (2.00 ± 0.23) and lowest in the thalamus (1.45 ± 0.46). Patients had reduced NAA/Cho compared with controls in the PCG (1.66 ± 0.14 versus 2.00 ± 0.23, P = .0001) and MCC (1.51 ± 0.13 versus 1.77 ± 0.18, P = .0004), but not in the thalamus (1.41 ± 0.21 versus 1.45 ± 0.46, P = .59). Clinical correlations existed between the rate of disease progression and PCG NAA/Cho (P = .007, r = −0.68) and between the finger-tapping rate and MCC NAA/Cho (P = .02, r = −0.45). NAA/Cho was significantly correlated among regions in healthy subjects (Fig 2). These correlations were not present in patients. Loss of neurochemical associations among regions in patients with ALS. Strong correlations of NAA/Cho are present among regions in healthy control subjects (open circles); whereas, in patients (closed circles, regression coefficients not displayed) significant correlations are not observed. 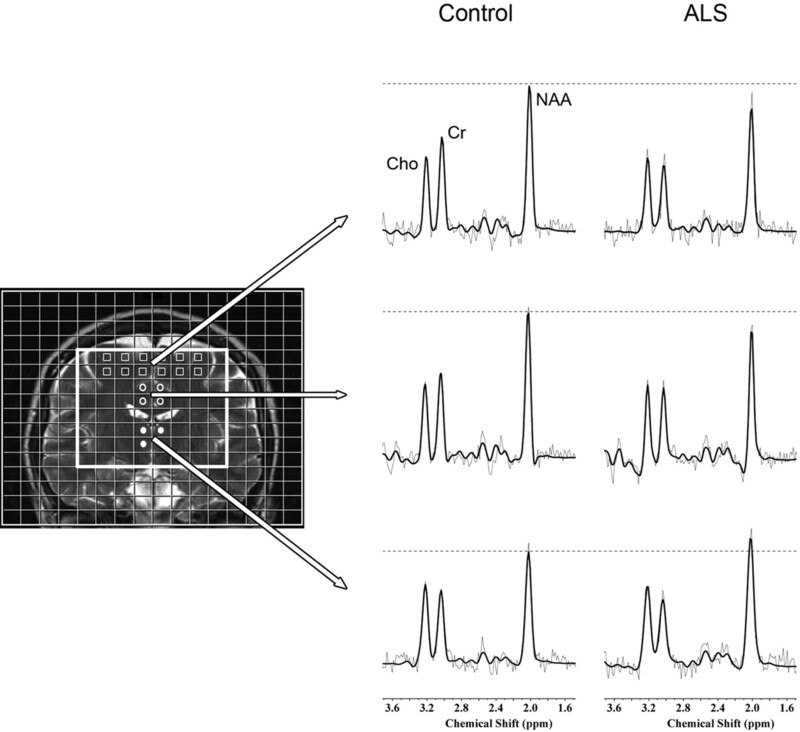 There is substantial clinical, pathologic, and radiologic evidence for the involvement of nonmotor areas in ALS.2,16–21 Previous MRSI studies in ALS have demonstrated impaired neuronal integrity in the motor cortex, frontal lobes, and brain stem, with the findings of reduced NAA and NAA normalized to Cr or Cho (NAA/Cr, NAA/Cho).22–25 The objective of this study was to assess in vivo neurochemical changes in the MCC and thalamus, 2 regions not previously studied with MRSI but implicated either by pathologic or imaging studies to be involved in ALS. Furthermore, the MCC has extensive motor connections and a large number of pyramidal neurons. The thalamus, though primarily an organ for sensory integration, also has widespread motor connections. It provides specific connections from the basal ganglia and cerebellum to cortical motor areas, and the thalamocortical system regulates the initiation and execution of movement.26 The reduced NAA/Cho in the PCG in the bulk of these patients was reported previously8 and is consistent with numerous reports of reduced NAA in the motor cortex in ALS. The novel observations reported herein are those with respect to the MCC and thalamus: NAA/Cho was reduced 14% in the MCC and was normal in the thalamus. TDP-43 has been identified as an important pathologic protein in some forms of FTLD and sporadic ALS.40 The presence of TDP-43 in both implicates common pathophysiologic mechanisms between these disorders that share clinical and pathologic features. The spatial distribution of TDP-43 was reported to include the anterior cingulate and the thalamus in 1 study.41 The widespread finding of TDP-43 outside the pyramidal motor system substantiates the neuroimaging abnormalities found in these regions and the behavioral and cognitive impairments present in some patients with ALS. Several reasons may underlie the finding of thalamic sparing in our study. MRSI may not be sensitive enough to detect in vivo neurochemical alterations. Because imaging evidence of thalamic involvement comes mainly from functional studies, these functional alterations may precede neurochemical or structural changes. Presumably, the presence of thalamic TDP-43 is not sufficient to produce neurochemical or structural changes that can be detected with the MRSI technique used in this study. In healthy subjects, a strong linear relationship of NAA/Cho, and thus probably neuronal density, was observed among the thalamic, cingulate, and motor cortex regions. The biologic significance of this is uncertain; however, it may be related to inter-regional neuronal connectivity. Previous studies with tracer injections, fMRI, and DTI have demonstrated a well-defined connectivity among the thalamus, motor areas, and the cingulate cortex.42–44 The CMA in the MCC project directly to the motor cortex and spinal cord in a somatotopic fashion.45–47 The motor information derived from the CMA is separately or simultaneously processed within the basal ganglia and returned to the frontal cortex by way of the thalamus. In ALS, the inter-regional relationships that were observed in controls appear to be lost. The simplest explanation for this is the concomitant degeneration of the PCG and MCC, which is due to a process of degeneration that is not related between these regions with respect to magnitude and rate. If degeneration was dependent on neuronal connections, then one may expect retention of a correlation. For example, this could be envisioned if degeneration began in the PCG with deleterious “downstream” effects (such as excitotoxicity) on neurons in other regions. Such inter-regionally dependent degeneration would presumably proceed at a common rate, and an NAA/Cho relationship would be preserved. This may also reflect the selective vulnerability of neurons in the motor areas, like the giant Betz cells and their axons, along with astrocytic gliosis, with less severe involvement of other neurons in the cingulate cortex and the thalamus, and may support the notion that certain areas may be affected earlier than others. An inverse association of MCC NAA/Cho with finger-tapping rate (a measure of the functioning of UMN) was observed in patients; we are unable to explain this finding because one would have expected a positive association. There are limitations to this study. Neuropsychological assessments were not performed in these subjects, which would have been useful to assess associations between cingulate degeneration and cognitive impairment, given that prior studies suggest that cingulate dysfunction is related to verbal fluency deficits.30 Neurochemical ratios were quantified rather than absolute metabolite concentrations. Although elevated Cho could conceptually contribute to the observed decreased NAA/Cho ratio, this is unlikely a major factor. Previous studies measuring absolute metabolites in ALS have inconsistently found increased Cho, yet all additionally documented decreased NAA.14,23,48–50 Compared with absolute quantitation, ratio determination provides a simpler and more reliable method with less experimental error. It would be worthwhile to follow up these findings with a study that incorporates absolute quantitation but with a larger sample size. Our voxel size allowed relatively good tissue specificity of the regions of interest. Although a higher spatial resolution would have improved the accuracy of this, absolute quantification of NAA and Cho levels would have come at the cost of a substantially increased scanning time, which is difficult for this group of patients. In summary, this study adds to the growing body of evidence of degeneration of the brain beyond the motor cortex in ALS. Future work should aim to determine the association of cingulate pathology with neuropsychological measures to obtain an improved understanding of the role of the cingulate cortex in motor, cognitive, emotional, and behavioral functions. Multimodal imaging, including MRSI, fMRI, and DTI, could help achieve this objective in both healthy and diseased states. DTI in particular would be instructive in better understanding the role of altered connectivity between regions. As principal author, Namratha Sudharshan takes full responsibility for the data, the analysis and interpretation, and the conduct of the research. She confirms having full access to all of the data and has the right to publish it. Statistical analysis was performed by S. Kalra, MD. This work was supported by the University of Alberta Hospital Foundation and the M.S.I. Foundation of Alberta. Accepted after revision July 10, 2010.